Two years ago, I took a vacation to India and spent two weeks at the Sivananda Ashram in Kerala. 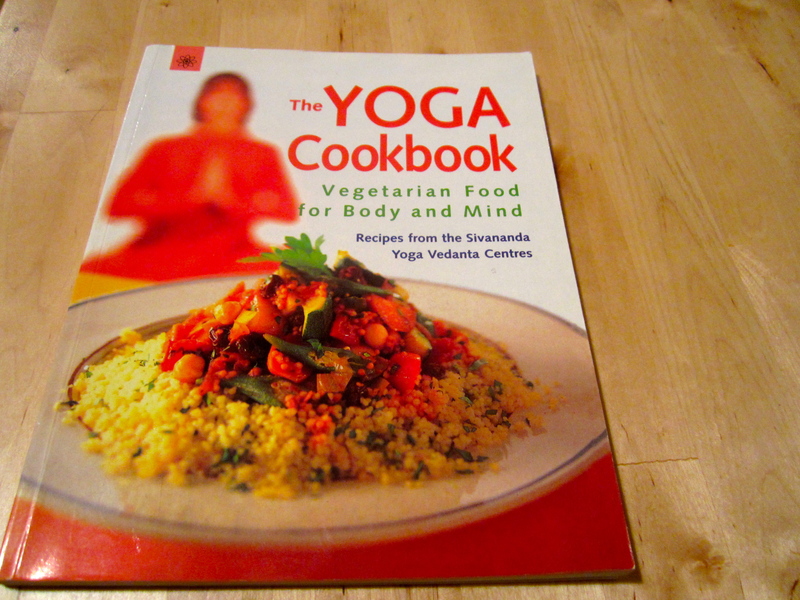 As someone who habitually reads cookbooks as bedtime stories, I was pleased to purchase “The Yoga Cookbook” in the ashram gift shop, and read through the (sattvic, i.e. very healthy) recipes between our evening meditation sessions and 10 p.m. lights-out curfew. I pulled the book back off the shelf the other day to finally try making the infamous “Sivananda Cookies” they often sell at the yoga center. 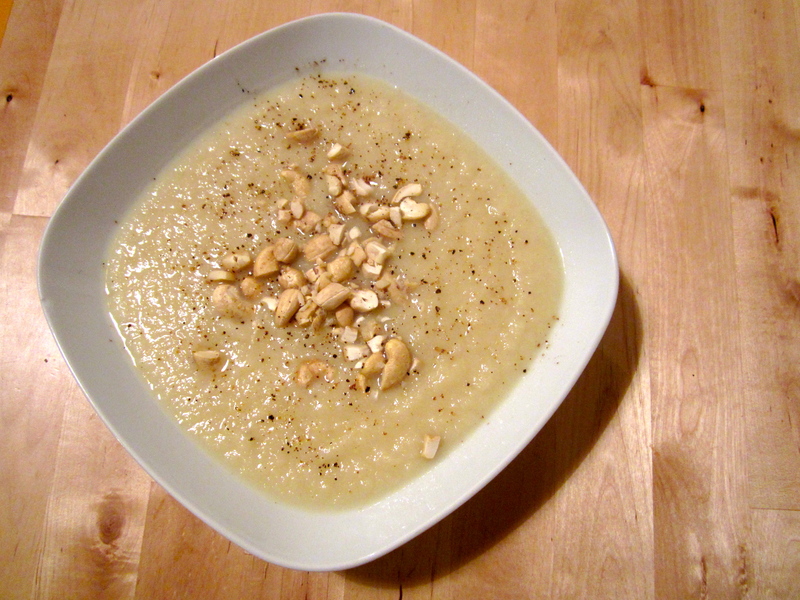 In turn, I ended up flipping through the recipes again, and found an interesting one: Nutty Parsnip Soup, which calls for 1-2 tablespoons of peanut butter as its “nutty” element. This got me thinking. 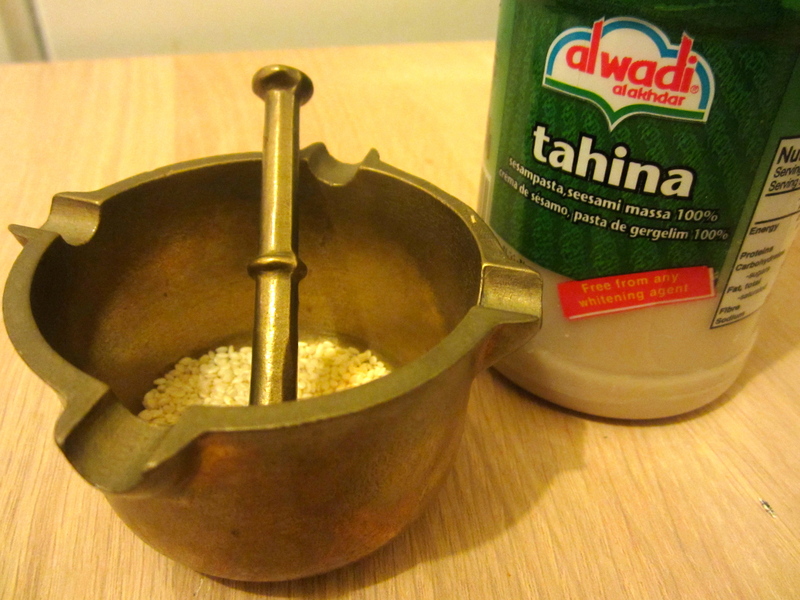 What about tahini? Could it be any good in a white-vegetable winter soup? I do, of course, having a thing for celeriac. And I love the woodsy, surprising flavor of parsnips. 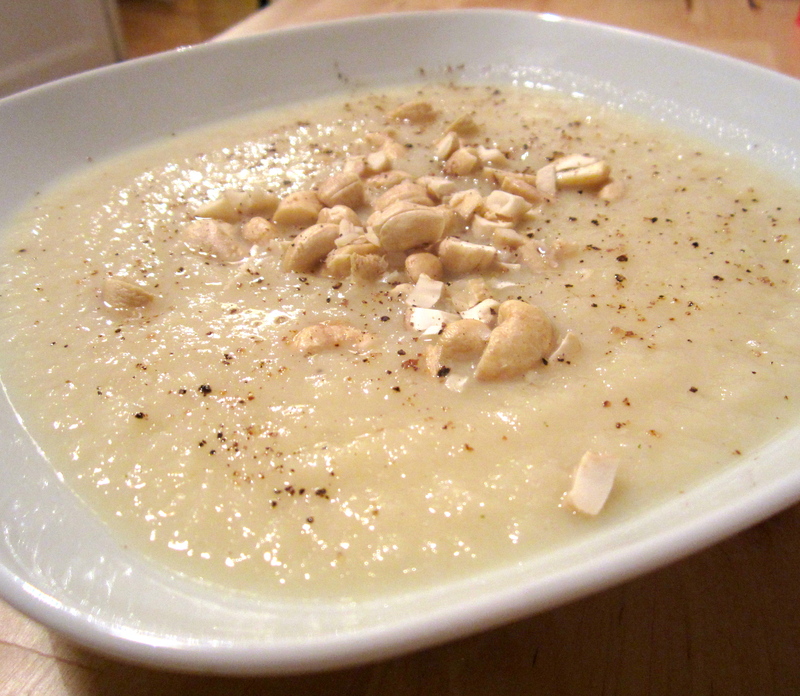 So here, I give you, a warming winter soup rounded out with tahini. Happy Sunday. Melt the butter in a large soup pot over medium heat. Add onions and cook until softened, 4-6 minutes. Add the parsnips and celeriac and let them heat up a bit in the pot, stirring, 2 minutes. Pour hot water or stock over vegetables, add bouillon if using. Bring to a boil, then reduce heat to a simmer. Stir in salt and pepper. Allow to cook for 15-20 minutes, or until vegetables are soft, stirring occasionally. Once vegetables are fully cooked, take the pot off the heat and mix the soup with an immersion blender. Stir in the tahini, and serve topped with salt and pepper, and chopped cashews or peanuts. Celeriac is one of my favorite vegetables. A smooth, nutty flavor – it is filling and satisfying like a potato, but with less than half the calories and a fraction of the carbohydrates. I usually associate it with winter – roasted in a tray with carrots and parsnips, or boiled in milk and blended into a puree. That doesn’t mean that it doesn’t grow in the summer – but its flavor is so often paired with winter vegetables than with the tomatoes and eggplants of summer. Brainstorming between the market stalls at the Marché Aligre, I decided the newly harvested celeriac would go well with radishes – still available in abundance and on sale at €2 for 2 bundles. 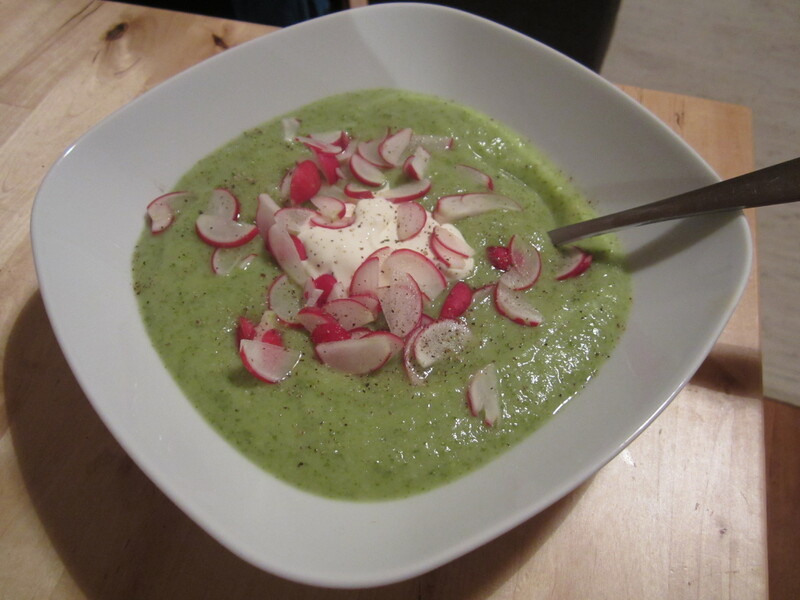 This summer I have experimented with adding radish and turnip greens to soups and serving them cold. First try, too stringy – I learned that you must cut the stems off and only use the leafy green part. 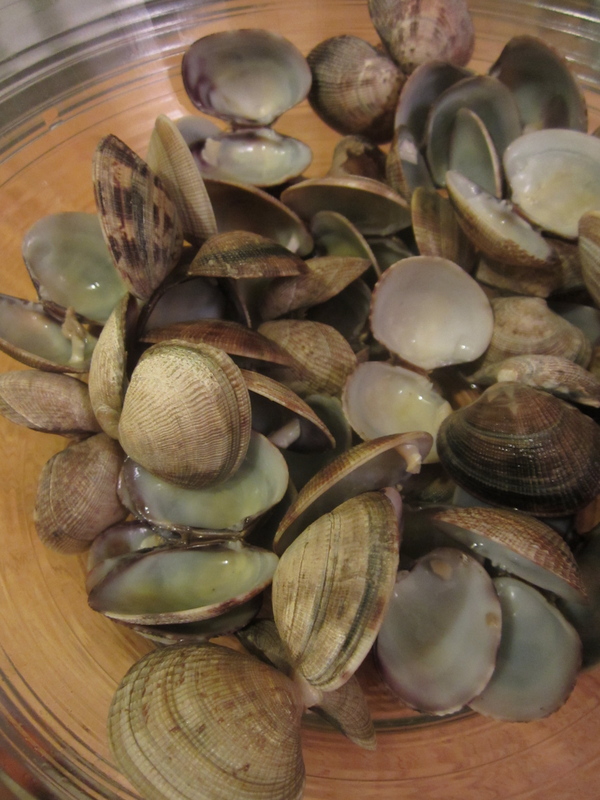 Then, too bland – needed more salt, and a bouillon cube. The third time was the charm, with homemade chicken broth and plenty of coarse grey sea salt from Noirmoutier. The greens need to be very thoroughly washed – I find three water baths in the salad spinner to be the bare minimum. Dirt particles and small stones stick easily to the thick leaves, which have an almost fur-like surface. I also find that the soup needs to be made the same day I purchase the radishes – otherwise, the leaves go limp and yellow in the fridge. Mix the soup with a hand blender off the heat. Serve hot with just salt and pepper, or cooled the next day with a dollop of crème fraîche, thinly sliced radishes, and salt and pepper.